Make this recipe once, and I’d be willing to bet you will make it again and again for the rest of your life. It is the perfect way to make a moist (but never sticky), buttery (but not cloying), flavorful (but goes-with-anything) rice. It’s infinitely easier than risotto, and much, much better than boiled rice. Any-Night Baked Rice. Photo by Deb Wiley, who won my photo contest for this recipe. I adapted this from a recipe by Pierre Franey, the French-born chef who wrote the “60-Minute Gourmet” column in the New York Times in the 1970s and ’80s. I’ve probably made it more than a thousand times in my life. 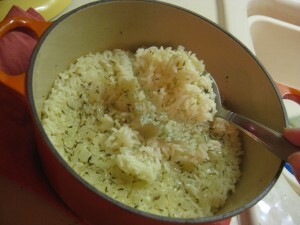 The basic ingredients are butter, onions, garlic, rice, chicken stock, and thyme. You can vary the seasonings and ingredients, just as Franey did: He’d toss in apple and curry for a Riz à l’Indienne, turmeric for Riz à Tumerique, pimiento or roasted red pepper for Riz aux Piments, Parmesan (after the rice is cooked) for Riz à Parmesan, and pine nuts (after cooking) for Riz avec Pignolats. You get the idea—though the basic recipe is exquisite in itself. Preheat oven to 425°F. Melt the butter in a medium flameproof, ovenproof pot with a heavy lid (I use the Le Creuset Signature Enameled Cast-Iron 2-Quart Round French (Dutch) Oven) * over medium heat. Add the onion and cook until tender but not brown, about 4 to 5 minutes. Add garlic and cook, stirring, until fragrant, about 30 seconds. Add the rice and thyme; cook and stir about 1 minute more (grains should start to cook a bit but not brown, and should glisten with butter). Add the chicken stock and then the bay leaf; stir to break up any clumps of rice. Bring to a boil. Cover the casserole tightly and slide it into the oven. Bake the rice for 15 minutes. Remove from oven; let stand, covered, for 5 minutes. Serve immediately or let stand, covered, in a warm place (such as on an unheated back burner) for up to 20 minutes more. Remove bay leaf and stir with a fork before serving. This pan is oven-safe to 550°F. PS: Any-Night Baked Rice is just the kind of easy, everyday French cooking that you’ll find in my cookbook, The Bonne Femme Cookbook: Simple, Splendid Food That French Women Cook Every Day. I love your cookbook. I found it right down the street at beaverdale books. I am so happy I came across it. Merci! That is so nice to hear. Enjoy! My wife and I love your cookbook, everything we have made has been awesome. We were wondering if you have a brown rice adaptation for the Any-Night Baked Rice? On occasion we just want to eat a little healthier. Can’t wait for your next book! Hi Mark! Thanks for the comment. I have not yet prepared a brown rice adaption….sounds like a great idea. I’ll put it on my list of recipes to develop! Thanks for the suggestion. Best. Rice.Ever. Making this for a second time tonight. I had to double the recipe as, my family went back for seconds and cleaned the pot out, when I made it the first time. Served it with your braised bottom round and french onion gravy recipe. Thanks, Deana. It is one of my favorite rice recipes ever. Truly–whenever I don’t know what I’m going to make for dinner, I sometimes just start chopping some onion and garlic for this rice, and the ideas will emerge …. You put this in the oven, and the exact time it takes to bake is about the time it takes to make one of my Saute-Deglaze-Serve recipes in the book. Dinner at its true-to-France best in about 30 minutes. It CAN be done! I finally made this for the first time on Friday and my family absolutely LOVED it! I know it will become a staple for us, and I am excited to try some variations, too. I would like to second the request for you to create a version using brown rice. An aside: I bought a beautiful green cast-iron pot with this recipe in mind. It’s not a La Creuset; it’s a Cuisinart, and was a mere $40 at TJ Maxx. Unfortunately, the lid is oven-safe only to 325 degrees. So I used my old Farberware pan for this recipe. Fortunately, it worked fine. Glad you liked it. Best. Rice. Ever. TJ Maxx is always a great place to look for seconds on Le Creuset, so keep your eye out for a pot. Then again, if it worked in your Faberware, there’s nothing wrong with that! I will keep my eye out. I’m not sure what the point is of a lid that only goes to 325! Maybe for a pot roast? Yes–probably for a very slow braise, and many braises are indeed at 325°F…. Hi Winnie… Jeff gave me your book for Christmas. Love this recipe… I had to improvise and finish on the stove but it is so savory! So glad you liked it….wonder why you had to finish it on the stovetop? It always cooks perfectly in the oven for me! Were you in a hurry? Thanks for writing, Allison! Hope all is well in the Rockies! 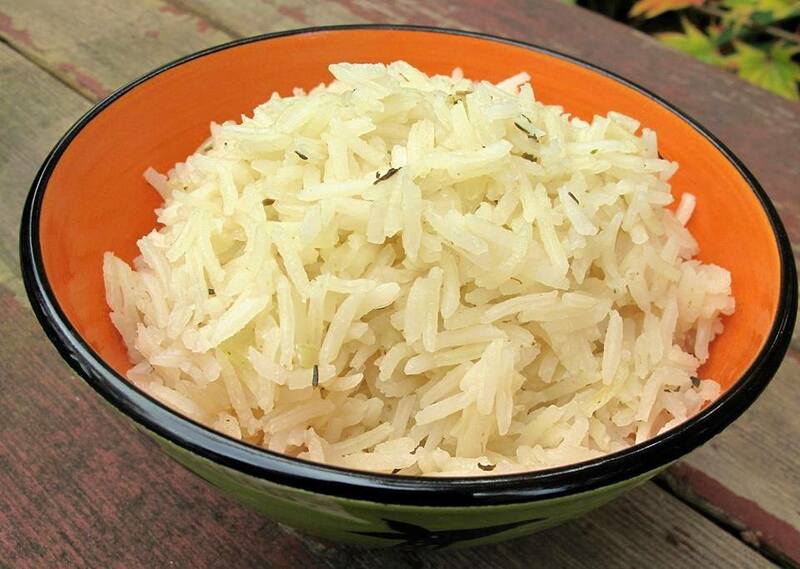 Wini, a quick question — do you rinse the rice first, or do you put it into the pot dry? Hello! Thanks for the question. I do not rinse the rice. I put it in the pot dry, and it starts to cook in the butter a little bit…..Hope that helps! Enjoy! I was wondering your opinion on subbing a medium-grain rice, or even a short-grain. Am I going to get a gummy mess if I play with grains and use what I have around, or could I end up with a creamier version? Then again, I suppose if there was a shortcut to risotto we’d all know about it, ha ha. Hi Katie! Fond memories of having you in class at Simpson College! Thanks for writing. I call it “Comté Rice” but you can use any good grating cheese. It’s a great little recipe and has a nice creaminess. As for Any-Night Baked Rice, make it as directed…I swear you’ll enjoy it. Can this be done for a crowd (x5) with any problems? I’ve taken it x3 without problems (obviously you need a large oven-going pot). I haven’t done it x5….but I don’t see why it wouldn’t work, as long as you have a large enough pot. Enjoy! Best rice ever. First time I made it, my husband said it was “restaurant quality.” We’ve made it several times since then and I love how I can make it and have it out of the way cooking while I prepare other things on my stovetop. Love the cookbook, too. Thank you, Lane. I have to say, it’s one of my favorite side-dish recipes….I have truly made it more than 1,000 times in my life. It goes with just about anything. Glad to hear it’s found another fan. Any updates on a brown rice version? This was outstanding!! I need to get on that. Thanks for the nudge! I’m always teaching myself to cook and yearn to be that awesome cook who is also that incredibly casual yet sophisticated host and entertainer. It’s definitely a journey and along the way I’ve picked up a couple of things from your blog. So in the spirit of learning I thought I’d share how I’ve adapted your recipe for brown rice. Barry! This is AMAZING information. You have no idea…I have tested this recipe twice in the last week, and both times, I cooked it too long. (I went by the instructions on the rice package). The rice ended up hard and dry. The key, it sounds like) is less cooking time but some standing time. I’ll give ‘er another go. Thanks so much, because I do want to use brown rice more–and this is a great way to make it tastier. Can this be made ahead and re-heated for dinner party? I don’t want to be in the kitchen while guests are arriving and want to eat an hour after they arrive. I’d like to make it a day before or the morning of the party. I suggest making it just before the party and keeping it in a warm place. It holds really well for about an hour. I have made it in advance, and it’s fine. That is, if the freshly made version is a 10, the made-in-advance version is about a 9. It might be slightly drier, but it won’t get gummy. If it seems dry, just stir some (wait for it…) butter into the reheated rice.